This product consists of 11 multiple choice quizzes, each with 10 questions. 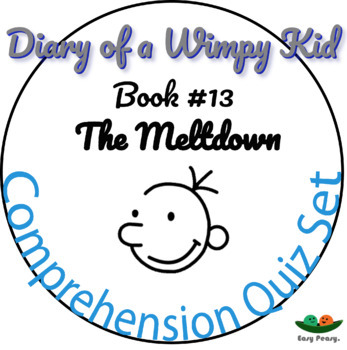 Each quiz covers 20 pages of the book, Diary of a Wimpy Kid #13, The Meltdown. Some answers are obvious after reading and some may take some thought or require process of elimination. The quizzes are perfect for elementary or middle school teachers, homeschoolers, parents or for ESL. The quizzes are quick and easy (if the students have done the reading!) with some tricky questions to keep things interesting. They are a great way to make sure that the reading is actually getting done and being comprehended. Diary of a Wimpy Kid 1 - "Original Book"
Diary of a Wimpy Kid 2 - "Rodrick Rules"
Diary of a Wimpy Kid 3 - "The Last Straw"
Diary of a Wimpy Kid 4 - "Dog Days"
Diary of a Wimpy Kid 5 - "The Ugly Truth"
Diary of a Wimpy Kid 6 - "Cabin Fever"
Diary of a Wimpy Kid 7 - "The Third Wheel"
Diary of a Wimpy Kid 8 - "Hard Luck"
Diary of a Wimpy Kid 9 - "The Long Haul"
Diary of a Wimpy Kid 10 - "Old School"
Diary of a Wimpy Kid 11 - "Double Down"
Diary of a Wimpy Kid 12 - "The Getaway"
The Complete Set - 143 Quizzes and growing!